I was inspired by the pizza tarts here at INGENUITY. My 12 year old nephew and I made them for dinner. They were delicious for dinner and also made a wonderful leftovers for lunch meal. 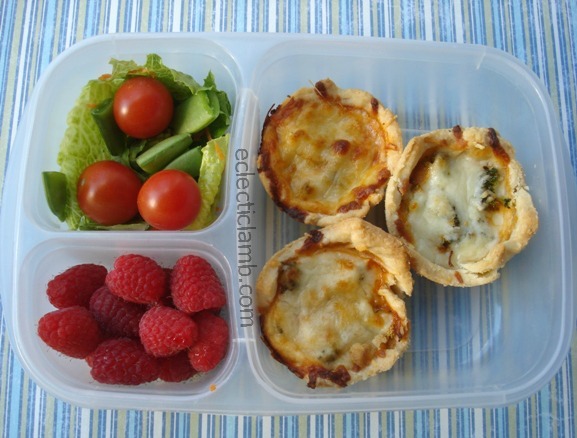 Pizza Tarts: I made a butter pie crust and fit it into standard sized muffin tins. I used a crust recipe for a double crust pie and it made about 18 tarts. (You could also buy pie crust and roll it out.) We filled the unbaked tarts with some small raw pieces of broccoli and tomato sauce. (of course you could leave out the broccoli or add something else) Then we covered it with Parmesan and Mozzarella cheeses. We baked them at 375 for about 20 minutes. This entry was posted in Bento / Cute Food and tagged bento, leftovers for lunch, vegetarian. Bookmark the permalink.